can you serve your customers this well? The internet is full of complainers about bad customer service (I am occasionally guilty of complaining) which really doesn’t mean a thing to most businesses unless something goes viral and who has time for that? Yet in addition to the occasional complaint, I also am of the school of â€˜don’t recognize a problem without offering a solution” as well as “be as effusive in your praise as you are in your condemnation”. (OK on that last one, I’m not sure there’s an actual school). So as you may recall from a Facebook post this summer (because where else was I going to share such useless information) I got a new suitcase. I know, the shock of that news probably still makes you woozy but stay with me here. The brand of suitcase I bought was Delsay and I bought it not because of the brand (which sorry to say I didn’t know â€“ not a student of luggage, just a very big user of it) but because of all the suitcases at the Marshall’s store I was in, it looked the best (believe me, I was in there for an hour checking every darn thing out). Well one day on a trip (again after only about 3 months of use) the handle just plain broke. I wasn’t even angry. Not surprised but maybe a little disappointed. I went on line to the customer service page of Delsay and saw there was a repair center in Buffalo at a very well respected luggage store. So I went over there to see how much the repair would cost. The gentleman at Militello’s Luggage was very nice and said before he quoted it, he wanted to call Delsay because it might be under warranty. 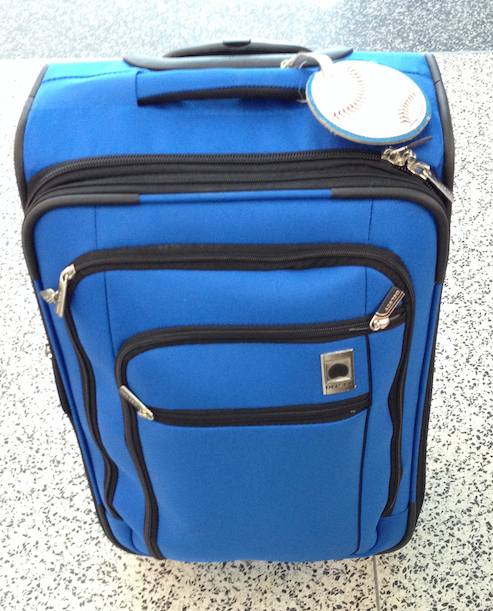 A bit embarrassed, I advised the owner I bought the luggage at Marshall’s â€“ a discount store. None the less, he said he would let me know what he heard and then call me back. Not only was it covered, but Delsay said forget the repair, we’re sending you a brand new suitcase. And not the same one, but, like a much nicer one than I bought. I had to pay $10 or something for handling. Done! Done with joy. Done with a happy dance — that might have kinda creeped out the guy from the luggage store. So in return, I must advise you, nay order you to only buy your travel luggage from Delsay. Period. No one else ever again â€“ Delsay is the brand to buy for your luggage. Cause mistake can happen occasionally and Delsay professionally fixes the mistakes. And I have not had a stich of problem with my new bag. Thank you Delsay. As voice-over talents, we specialize in “theatre of the mind”. Our job is to create an image, a presence, a brand in the mind of the listener. We get paid to pretend and it’s pretty great. 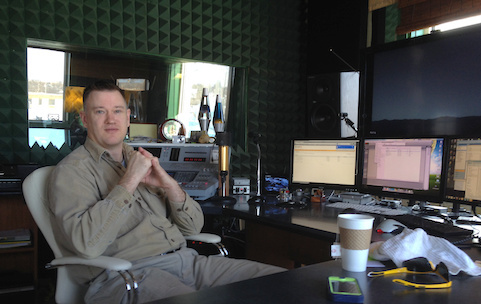 Within our own work space, voice talents do some great pretending too. Some VO’s like Joe Cipriano build wonderful voice-over studios within their property that are visually and audibly amazing. Some have pre-fabricated studios like Whisper Rooms to record in. 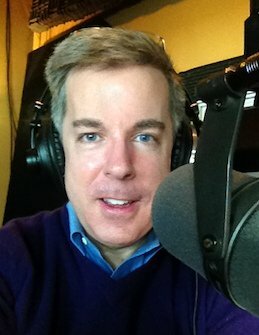 Other voice talents work in their closets, surrounded by heavy winter coats or movers blankets. 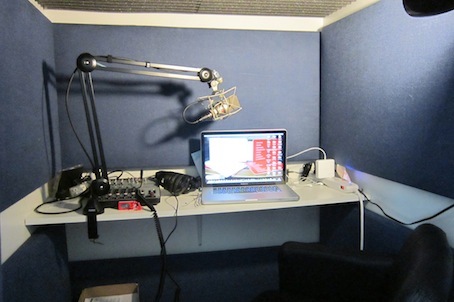 I hesitated to write this post about my new voice-over booth for fear it would come across as boastful in someway. That’s not the intent; rather I hope this gives you helpful ideas if you are thinking about changing your voice-over recording space. There are a thousand variations of voice-over recording booths, all simply want to ensure the best possible audio fidelity even if most of our studios will never make it to the pages of Architectural Digest (well, Joe’s might). Anyway, the beauty of the studio is in the eye of the beholder as, individually, we’re usually the only ones who see it. For years I’ve been cranking out tons of national, regional and local voice-over projects from a little sound box I made from old shutters and some foam. It has worked wonderfully and clients have been well pleased. I wasn’t concerned that it was short on looks. But in the past few years, I have been concerned that it was not conducive to one important area of voice-over performance…I could not stand and record in my old set up. I was limited in the physicality of my performance. With certain voice-over scripts, the physicality of the performance can really come through. I needed to change my voice acting set-up. I’d been thinking about it, talking about it but for a myriad of reasons, I didn’t just get it done. Until now. My goal was to create a great sounding space (quiet but not dead sounding), that gave me the physical space to perform sitting or standing, that worked within the dimensions of the room (a kind of reading room off the living room where I keep my office) that would be somewhat attractive (cause it would be in the space off the living room). Over at hardware store, they sell White Thermally-Fused Melamine board in sheets of 4’w x 7′ h and about 3/4″ thick. They are sturdy and attractive. With those boards, I had a carpenter friend of mine build a 3 walled box with a roof (cause handy I am not…my wife is though) and put it in the corner of the office. Inside the booth, there was installed a counter. 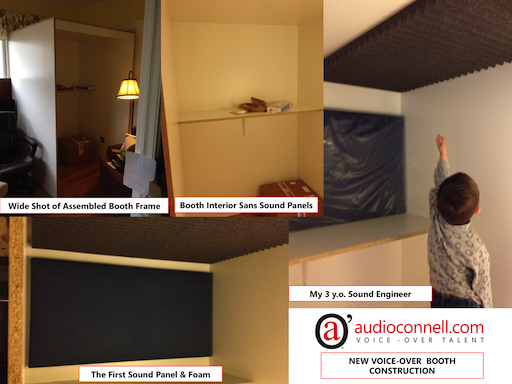 Then, based on a video recommendation from George Whittman and some insight from Dan Friedman, I ordered custom built acoustical panels for the interior and put some sound foam on the ceiling. On the fourth wall (which I didn’t want to enclose at this time) hangs a very heavy curtain (wife’s idea). Simple. I had the sound tested by a long haired audio recording expert in North Carolina who said the recorded sound quality was excellent. I’m happy, the wife is happy and clients didn’t even notice a change. But I do. Not just in the physical space but the ability I have now to vary my performance. I move completely differently within this space and I think you can hear it in the performance. We’ll see what happens from here. This will surprise you: I was on a plane on Thursday. And when I landed in Chicago on my way to Green Bay, WI, (with no weather related travel hassles mind youâ€¦zoinks!) I got an email from my voice-over agent Erik Shepard from Voice Talent Productions. Recording new projects on the road is not a problem with my laptop and my Sennheiser 416. But this instance was unique because I had recorded the bulk of this project in my acoustically studio with a Neumann TLM-103. Now the client would have to prospectively match that studio audio with new pick-up audio recorded in a hotel room (pillows and blankets and noise floors, oh my) on my 416. It had the potential to be an awkward audio match and an inconvenience for the client. You see, whenever I travel, I make it a point to know where any local recording studios are. I believe it’s just smart to have a back-up plan and sometimes you get to make new friends. I’ve been amazed to find some cities (towns, hovels) don’t have ANY recording facilities (â€˜try the AM radio stationâ€¦they have 60 year old egg cartons on the wall for sound absorption’) so if you want to be audio king pin in Ottumwa â€¦.email me and I’ll get you directions. But in Green Bay some years ago, I was introduced to Carl Romey by my friend, fellow voice talent and FaffCon Stand-up group member Kelly Klemolin. Carl runs The Bridge Recording Studios in Titletown. 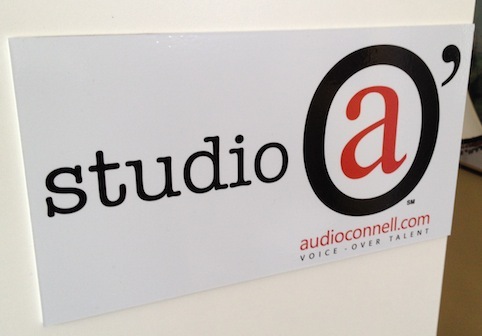 While Kelly has her own ISDN and ipDTL equipped studio, she often records at Carl’s studio; Kelly is a very in-demand voice talent (and a whiz on QuickBooks). Carl’s studio is terrific and he’s a prince of a guy (hence the blog post title). So I called him Thursday when I landed and told him what I was trying to accomplish. He told me to stop by early Friday morning (today) and he’d fit me in. His studio is always busy â€“ Carl is a very popular producer. So up to his 4th Floor studio I flew and banged out those pick-ups in nothing flat. 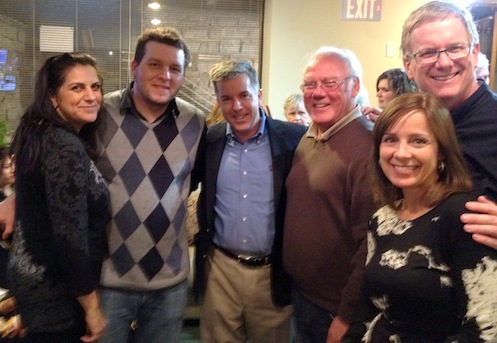 As you might expect, he couldn’t have been more gracious or accommodating. I was happy, Erik was happy (or as happy as he gets 😉 and I believe the client was happy. Thanks Carl. And thanks Kelly. Green Bay is full of good people. And good football. Friday night the weather was not frightful but the traffic was (hey, it’s Toronto, there’s always traffic) — none the less it was a great night for my awesome Canadian voice-over agents at Ta-Da Voiceworks to host their Christmas party. I love the idea of hosting a holiday party in January because December is so socially nuts for everyone. Further, few other months really need a party as much as January, especially in the northeast and especially THIS winter. So in addition to seeing voice-over friends like Bill Hunt, Graeme Spicer and Debra Scott (all of whom I know through Ta-Da Voiceworks, FaffCon and the terrific VO in TO meet-up ((which is hosted by the super duo of Patrick Sweeney and Jodi Krangle – who in spite of her tasty marketing never actually has anycake with her, like ever)))- I got to see the new, bigger Ta-Da offices that opened in November. Darryl has built a really nice voice-over booth right in the middle of the office so talent can do auditions there or clients can host auditions. He did a really nice job on it. Folks at the party make too big a deal of me being willing to drive 2 hours from Buffalo to come to this very nice party in Toronto. I don’t see it as a long drive but rather as an opportunity to support my team. My agents are part of my sales and marketing team and I am a part of theirs. Whenever possible, if they host events, I want to support them just like they support me out in the marketplace on a daily basis. That’s what business teams do.